The Crossfire Minute: Did You Start In Grace But End Up Somewhere Else? Today I’ll continue on the topic of grace. Grace is means ‘undeserved favor and acceptance.’ By accepting Jesus as Savior, you receive undeserved favor and acceptance from God the Father. Many Christians accept grace as a gift, then create a list of things to do to be acceptable to God. This to-do list becomes their new law. 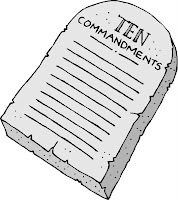 It becomes their new ten commandments. It’s their law of acceptability. Paul told the Galatians in Chapter 5 that such behavior was a ‘fall from grace.’ Every Christian must be careful not to fall from grace. If you’ve got a to-do list thinking each accomplishment will make you more acceptable, then you’ve fallen from grace. You may have started in grace, but you’re living in legalism.